Everybody is more or less cautious about their own safety. This is especially true in the street. To avoid unwanted hazards or an attack by a stranger it is necessary to have some knowledge of self-defense. Kickboxing and boxing are types of training that can enable you to protect yourself. However it is not necessary to master in both of these. Perhaps your interest in either sport is drawn from a desire for physical fitness, an affinity with superheroes or the just for the fun of it. Let’s differentiate between boxing and kickboxing. Continue reading to learn a little more about these two different types of sport. As the name suggests we can say that kickboxing is a kind of boxing that uses hands and legs. It refers to the sport of kicking and punching. It is an authenticated way of self defense and general fitness. While boxing is a kind of combat sport, boxing is when you can only make use of your fists. We can see this fight very often on our televisions. This game is supervised by a referee and judged by observers. Kickboxing can be of two types. One is full contact and the other is the semi-contact type. The techniques adopted in boxing and in kickboxing are not same. In boxing, the prime techniques include stance, punch, defense, guard, etc. Punches can again be sub-divided into jab, cross, hook, uppercut and others. In kickboxing there are some additional techniques of leg. 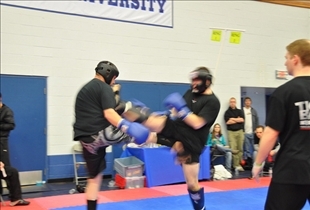 A few are front kick, side-kick, semi-circular kick, as well as some knee action. No matter the technique, there is one thing in common between them; you need to be very vigilant and cunning. This is because your opponent will always look for your weak point and strike you accordingly. Safety is one of the vital components in these games. 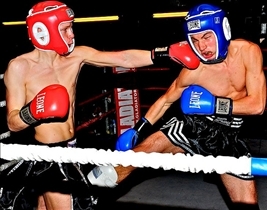 In the full-contact kickboxing the male boxers are bare-chested wearing shorts. Their protective gear includes: mouth-guard, hand-wraps, 10-oz. boxing gloves, groin-guard, shin-pads, kick-boots, and optional protective helmet. The dress code for female boxers is tank top and chest protection in addition to the male protective gears. There are few more precautions for the amateurs. It is required for them to have a headgear and a sleeveless shirt in the color of their corner. All these protective gears are to ensure safety of the competitors. Kickboxing involves the use of both hand and leg while boxing allows the use of fists only. Boxing is comparatively safer than kickboxing. Ensure self-guard before the game and check each and every safe gears. Both of these are ways to defend yourself from an attacker or if you find yourself in harms way. They both might be practiced differently but they both can be dangerous and should be practice and taught by skilled professionals. While kickboxing may seem more dangerous, boxing is also dangerous. Which form of self-defense requires more exercise?